What we have here is quite a puzzling video. 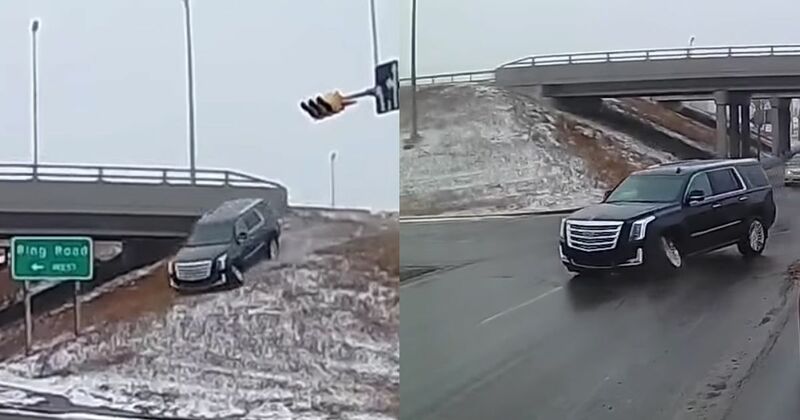 Dashcam footage shot in Regina, Saskatchewan, Canada shows a Cadillac Escalade launching over something - possibly a median strip - before charging down the embankment of a highway the vehicle was presumably on moments before. 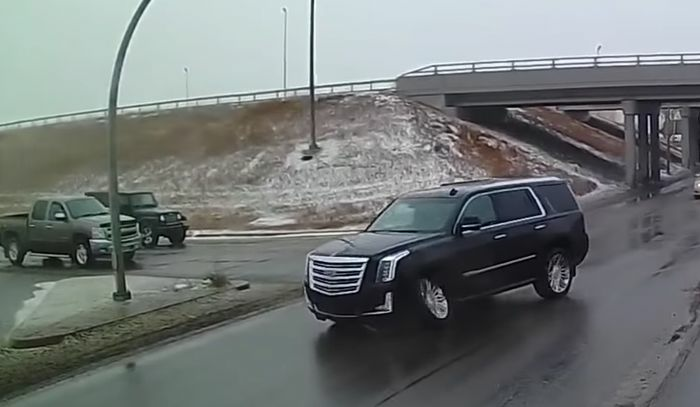 Despite some painful-looking front suspension damage giving the front-left wheel some ridiculous camber, the Cadillac is almost immediately driven away from the scene. It could be that the driver took an ‘improvised’ exit from the highway after missing the proper one, damaging the suspension when clattering over the median. Or, maybe the damage occurred earlier on, forcing the, erm, unconventional manoeuvre. (Edit: a local has since been in touch to tell us that this particular piece of road is notorious for black ice, which combined with the fact there’s a curve before the junction, could have been a factor). With no background information to go with the video other than the fact it happened on 28 November, your guess is as good as ours. Regardless, it’s fortunate oncoming traffic was stopped at the time of the bizarre incident.